So it seems the next step we’re waiting for with Aderans, is for them to begin Phase 2 trials sometime this year, which phase will last approximately one year? Is that correct? Do we know around when the Phase 2 will begin this year? » 2 will begin this year? Close, but not exactly. Phase 2 actually started in 2009. 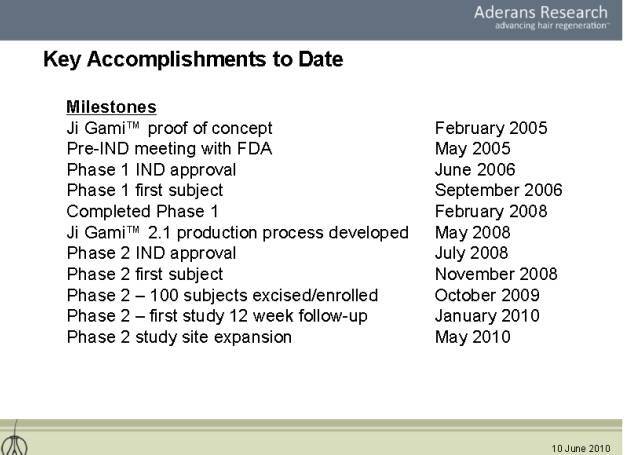 However, Aderans is running multiple treatment arms in order to enhance their “portfolio of products.” There are apparently 4 distinct versions of their Ji Gami process, of which they have only tested the first. 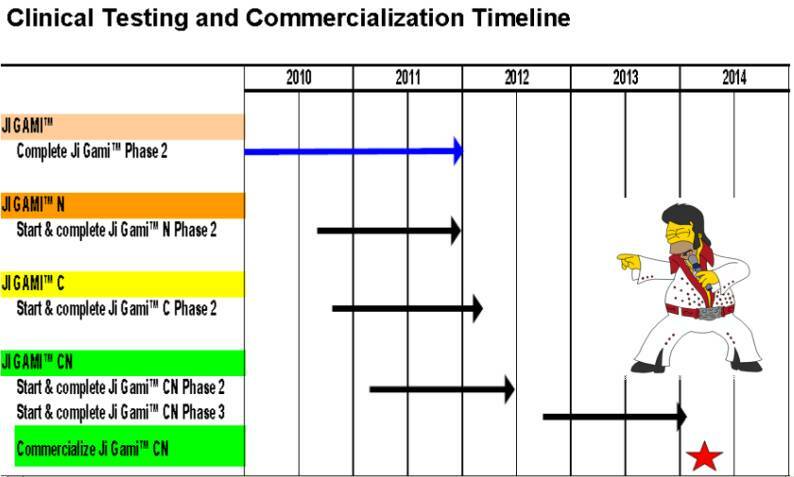 For the next several years (into 2012 I believe) they will be running Phase 2 testing for the other three treatments. Eventually they will single out the most effective version and run a Phase 3 (which should last about a year). The company is projecting a release in early 2014, but that is only if things progress speadily and the treatment becomes more efficacious over time. According to an update they gave to their shareholders in June of this year, Phase 2 for their second, third and fourth treatments should begin shortly. Enrollment might already be complete, and we can expect them to start roughly around September/October. » » 2 will begin this year? » Close, but not exactly. Phase 2 actually started in 2009. This is really the make-it-or-break-it phase IMHO. If phase#2 comes out well and they procede to start setting up a phase#3 trial, then we should have decent odds of actually seeing the new hairs on our heads within 5 years. It’s not a sure thing at that stage but it is a totally realistic thing to hope for IMHO. Still 2014 is 3.5 years away! I for one hope they can come out by then. If someone gets an HT to fill some thinning area in, can he still get the Adreans/ Histogen treatment done? correct me if im wrong,but doesnt that Adreans treatment work in conjuction wih an HT? » Adreans/ Histogen treatment done? » conjuction wih an HT? JB: 13) What insights or predictions do you have regarding the future of HM research in general? Dr. Gho, 2005: In my opinion HairMultiplication in general, the technique which consists of Tissue Engineering Hairs will be the future of Hair Restoration. However, if HairMultiplication still involves the stimulation miniaturized follicles, with HairMultiplication it is impossible to create a high density when someone has been bald for a long time. This is because the miniaturized follicles has to be found. In these cases, HM has to be combined with other techniques like HairStemcell Transplantation. That doesnt really answer my question? » That doesnt really answer my question? Oh, sorry, but does the following answer your question? In the photos, you can see that the density of the graft implantation is not that high. This is because each graft [in general] needs a ‘so-called’ recovery zone. If the whole transplantation process is carried out in the same area all at one time, there is a good chance that not all the transplants will ‘take’ and also scar tissue may form. Gho Clinic recommends that where necessary, the transplantation in one particular area be carried out over several treatments, with an interval of at least 3 or 4 months before consecutive work is done on the same area. “Other treatments and medical advancements of the future” like Histogen’s or Aderan’s “Ji Gami” or similar approaches ! Cheers iron man, so it does look like it cant affect future treatment, thats a shame! Iron man, in the Adreans viedo posted on thier site, its says it can be used with/ or add to a HT? » used with/ or add to a HT? Guys why dont you just think. The Ari Solution what does it actually do? Question : Dear Ari i got my whole head plastered with Hair (FUT) iam so glad i have a full head of hair (YOU WISH IT IS JUST AN ILLUSION) my vertex was also plastered with a jillion gazillion grafts. Can i get a full hair? ANswer : Nope iam sorry it wont work for you as it will work with non HT Patients, because during your HT you destroyed precious follicles which can not be regenerated. Even if our treatment works with you, you will never get the density you desire nor a full head of hair. And unfortunatly you have to eat FIN for the rest of you life, to slow down your hairloss process. To make things short : The minimal tradeoff you should do right now in this year is the following. If you are Below Norwood 5 and have good hair conditions and your hair loss is mainly stopped, you should pay a visit to GHO if you really want it. But you should only do the frontal zone nothing else. If you are NW5 and higher or most likely going to this part, you should choose a very good FUE doc and also repair your frontal zone and only your frontal zone as freaking dense as possible. BUT REMEBER KIDS : NEVER TRY TO PLANT THE VERTEX AREA CAUSE THEREFORE THE ARI TREATMENTS ARE GREAT. This is actually the less time and money consuming option ypu have right now. But dont do anything with your vertex area you will regret it. If you choose my way, well then in a few years you will never have to fear anything or eat fin again. I tried to tell that to people in a german FUT dominated forum, well the result was terrible believe, so its up to anyone else here what to do and what to expect. Question : is a bald head reversible? Question 3 : For everyone? » » used with/ or add to a HT? » Guys why dont you just think. » The Ari Solution what does it actually do? » was also plastered with a jillion gazillion grafts. Can i get a full hair? » the rest of you life, to slow down your hairloss process. » this year is the following. » But you should only do the frontal zone nothing else. » frontal zone as freaking dense as possible. » ARI TREATMENTS ARE GREAT. » But dont do anything with your vertex area you will regret it. » anything or eat fin again. » Question : is a bald head reversible? » Question 3 : For everyone? what the heck are you talking about? ari technology multiplies cells in lab which induce new hairs when those cells injected back into your scalp. it also could rejuvenate your old hairs what was in your scalp. so, if they can create brand new hair in lab then you can have full head of hair and it doesn’t matter how many hairtransplants you have had previously. you just must have enough donor hair (20-100 hair or so) what they can get from back of your scalp and thats all. histogen technology rejuvenates old hair and i think if you have been long time bald then histogen technology doesn’t work for you. histogen probably works well if you are loosing your hair currently and it sounds to me that their treatment is more like “advanced propecia treatment”. they don’t create brand new hair. they wake up old existing hair. this is what i think about the both companies. btw… i don’t belive ari gives you full head of hair after single treatment. probably you need several treatments over some months to get full head of hair. » » » used with/ or add to a HT? » » Guys why dont you just think. » » The Ari Solution what does it actually do? » » not be regenerated. » » the rest of you life, to slow down your hairloss process. » » this year is the following. » » But you should only do the frontal zone nothing else. » » frontal zone as freaking dense as possible. » » ARI TREATMENTS ARE GREAT. » » But dont do anything with your vertex area you will regret it. » » anything or eat fin again. » » what to expect. » » Question : is a bald head reversible? » » Question 3 : For everyone? » lab which induce new hairs when those cells injected back into your scalp. » of your scalp and thats all. » create brand new hair. they wake up old existing hair. » this is what i think about the both companies. » full head of hair. believe,believe,assume,could,should,would,think,probably,may,sounds to me,what i think. But you are not into the whole thinking thing are you? Othwise you wouldnt have just bashed my (fact based) theory. So if ari fails and histogen not, just in this particular case, whats then Craphook? Exactly my theory will be proven right. So actually what you think is more or less not interesting, because we are gonna acuumulate the worst case scenarios to give a proper strategy for all those who are actually in the WORST CASE situation. Really? From Histogens site: ReGenica is a proprietary liquid formula created by the culturing of newborn fibroblasts in an embryonic-like environment, and then harvesting the naturally secreted embryonic wnt proteins, growth factors, and other synergistic bioproducts that are produced. It is the first naturally stabilized and bioactive formulation of wnt proteins and natural cofactors, which are thought to act in the formation of new hair follicles. » » create brand new hair. they wake up old existing hair. » formation of new hair follicles. if i get histogen injecton to the place where i never haven’t had any hair, for example hand/volar then i can have there brand new hair? really?? i don’t believe so. what develops hair there? Remember there was a cancer patient taking Gefitinib who accidentally grew thick dark looking hair on the end of his nose. Folica’s experiments using human skin on the backs if mice were regenerating all-new follicles too. » » » create brand new hair. they wake up old existing hair. » » formation of new hair follicles. » hair, for example hand/volar then i can have there brand new hair? really?? » i don’t believe so. what develops hair there? Krakpot- listen to this interview. Histogen, out of all the potential cures/solutions out there, seems to show the most promise. I believe they really have something here because they are NOT rejuvenating but creating brand new “baby” hair follicles. There seems to be a problem with efficacy with all the methods that concentrate on rejuvenation. I know most of you have heard this interview before, but I still believe that this is the technology that we should be discussing.